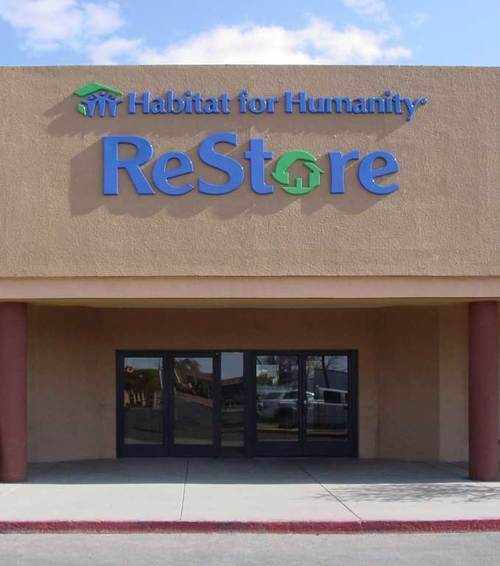 This project involved the relocation of the corporate offices of the Santa Fe Habitat for Humanity and their beloved ReStore from an old industrial building to an 18,000 sq. ft. retail space in a prominent shopping center. It was a tenant improvement project, on a limited budget, that converted a former CD/bookstore into both retail and office space. The ReStore is a kind of thrift store for building materials. They take donated recycled/reused materials, and in-turn sell them at greatly discounted rates. The renovation of the retail space for the ReStore was pretty straight forward, utilizing existing lighting and HVAC to the greatest extent possible. We also designed a shop space, for receiving and processing donated materials, and an exterior materials yard. We designed the private offices and conference room as “mini-houses” to showcase Habitat’s mission to provide decent affordable housing for families most in need. Volunteer Labor and recycled building materials from the ReStore; including windows, doors, lighting, tile and wood beams; were utilized to create an attractive workplace on a limited budget.